Alikat Corner: Fun is hard work! 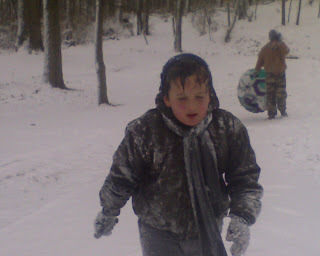 After many trips sledding down the hill, and many snow ball fights, Conor is sweaty and snowy. This was right before we left to go home so that he could get warmed up and get some dry clothes on! He didn't want me to take his picture, but hey, what are Mom's for if not to do what the kids don't want? Awww! He looks so tired and miserable!! I remember being outside till I felt that way, it was awful!! Then mom took me in the house, I got a warm bath and a snuggly nightgown. I'd stand on the register to keep warm while she made hot cocoa. Good ol' Mom she sure made the memories sweet! In spite of the unwanted photo, I'm sure you'll do the same for Conor!